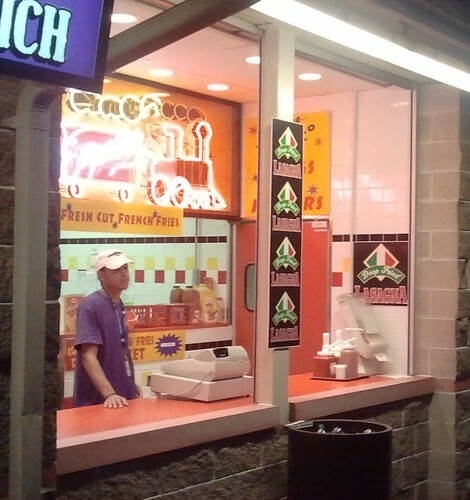 It seems that every year, one particular food item at local state fairs catches a special buzz and becomes a highly-anticipated and sought-after treat. In years past, this has happened to deep-fried cookies and burgers served on glazed-donut buns. 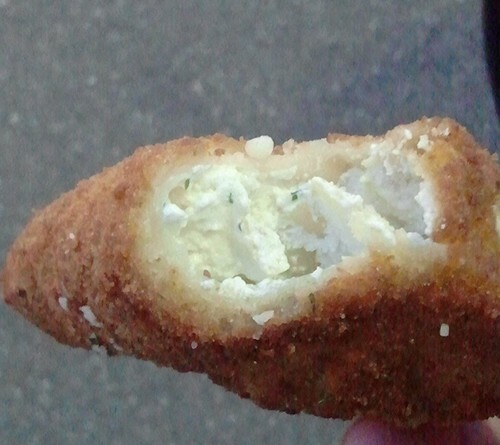 This year, the food which everyone is looking for at The Big E is the deep-fried lasagna. A serving of fried lasagna consists of two "packets," each a little less than four inches or so square and about 1½ inches thick. The packets are made of long lasagna noodles, folded in thirds around a filling of seasoned ricotta cheese, then breaded and deep-fried to golden brown and served with a sprinkling of Parmesan cheese and a small tub of marinara sauce. The outside coating is crispy while the lasagna noodles retain just the right amount yielding softness. Meanwhile, the ricotta filling is smooth and creamy (very creamy, actually, almost - but not quite - to the point of being wet.) There's no mozzarella cheese involved at all, and a minimal amount of seasoning in the ricotta; while the lasagna is tasty, this makes it almost bland. And that is where the marinara dipping sauce comes in, and that stuff is so good, you could almost consider it a "secret ingredient." Not only is it a perfect accompaniment for the lasagna, but it was almost good enough to eat with a spoon. Look, I know those guys probably ladle that sauce out of a can or something, but I'm telling you I would love to know what company is filling the cans. That marinara tasted so tangy and so fresh that it was almost as though this fast-food joint was taking the time to cook down freshly-picked vine-ripened tomatoes. Another great thing about the taste: There was no oil flavor whatsoever. With properly-prepared fried food, you'll taste the food and not the oil. But let's be completely frank about your typical deep-fried-junk-food palace, especially at a place where they're cooking as fast as they can all day to meet a huge demand: sometimes the oil doesn't get changed enough. And when you're cooking something with as subtle a flavor as fried pasta, any off-taste in the oil will come through strongly in the food. So a huge thumbs-up to Chicken Express (the sole Big E purveyor of fried lasagna) for not only keeping their oil fresh, but also for keeping their fryolators good and hot, ensuring that the outside crisps up rapidly and prevents the food from absorbing excess oil. 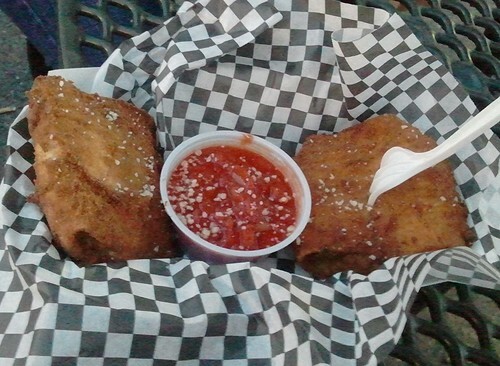 I think it's safe to say that I would totally recommend fried lasagna to anyone at the Big E.
Find deep-fried lasagna at Chicken Express in the Food Court. 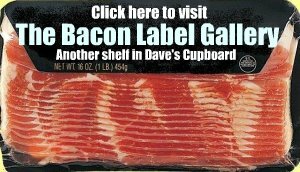 One serving, as shown in the photo above, is $7.00. Maryanne and I found that one serving was enough for us to share, and the friendly, hardworking Chicken Express staff are perfectly happy to give you an extra fork if you ask nicely.